The Freedom Historical Society (FHS) invites its members to come to Freedom Town Hall on Elm Street on Wednesday, October 24 at 5:30 PM for the Annual Membership Potluck Dinner and Meeting. All members and guests are invited to the scrumptious potluck dinner prior to the membership meeting. Baked ham will be provided as the main dish so please bring a side dish or dessert to share. A brief business meeting will be held after dinner to elect 2019 officers. All members are encouraged to attend to learn about the great progress FHS has made toward the Society’s goals. At 7 PM, following the potluck dinner and annual meeting for members, Freedom Historical Society, in concert with the NH Humanities Council, is pleased to present the last program of the season: “Songs of Old New Hampshire” presented by Jeff Warner. The program is free and open to the public. Jeff Warner connects 21st-century audiences with the music and everyday lives of 19th-century people. He presents musical traditions from the Outer Banks fishing villages of North Carolina to the lumber camps of the Adirondack Mountains and the whaling ports of New England. Warner accompanies his songs on concertina, banjo, guitar and several “pocket instruments,” such as bones and Jew’s harp. Warner is a Folklorist and Community Scholar for the New Hampshire State Council on the Arts and was a 2007 State Arts Council Fellow. He has toured nationally for the Smithsonian Institution and has recorded for Flying Fish/Rounder Records and other labels. Drawing heavily on the repertoire of traditional singer Lena Bourne Fish (1873-1945) of Jaffrey and Temple, New Hampshire, Jeff Warner offers the songs and stories that, in the words of Carl Sandburg, tell us “where we came from and what brought us along.” These ballads, love songs and comic pieces, reveal the experiences and emotions of daily life in the days before movies, sound recordings and, for some, books. Songs from the lumber camps, the decks of sailing ships, the textile mills and the war between the sexes offer views of pre-industrial New England and a chance to hear living artifacts from the 18th and 19th centuries. Refreshments will be served following the presentation by Mr. Warner at 7 PM. Please call 603-539-5799 for additional information. Freedom Historical Society (FHS) is pleased to have Anne Gaudette and Roberta McCarthy, FHS Board Members, present “Remarkable People of Freedom’s Past”. This program will delve into the histories of the remarkable Freedomites featured in the society’s 2019 fund raising calendar. Anne and Roberta will share some lesser known facts and stories about these Freedom citizens who each helped shape Freedom and make it the wonderful community it is today. People attending this presentation are invited to help make it an interactive discussion by coming prepared to share personal stories, photos, anecdotes or remembrances they may have about any of the people featured in the 2019 calendar. Learn about the largest landowner in Carroll County and the state in the mid 1800’s. “Meet” Nellie Huckins, who has been memorialized by Camp Huckins. Learn which famous American painter and equally well-known author were best friends while enjoying Freedom in their day. The public is welcome to attend this interesting program at 7 PM at Freedom Town Hall on Elm Street. The presentation is free and open to all wishing to attend. Refreshments will be served following the presentation. For additional information, please call 603-539-5799. Freedom Historical Society is pleased to welcome well-known author and speaker Jane Nylander, President Emerita of Historic New England. A summer resident of Freedom, Ms. Nylander will provide the audience with the privilege of previewing her current research topic and forthcoming book in this special illustrated talk. For centuries Americans have celebrated their public identity with parades of marching politicians and soldiers, stirring music, colorful flags and banners, ornamented fire engines, costumed school children and colorful floats set forth on the stage of town after town to symbolize traditions and values that Americans hold dear. Sometimes sophisticated, often naïve, but always visual, narrative and intentionally ephemeral, parades present visual stories of deep meaning to those involved. Ms. Nylander’s talk will explore both story and significance, focusing on parades in New England from the time of those celebrating the ratification of the Constitution in 1788 to the Tercentenary celebrations of the 1920’s and 1930’s, before concluding with some rare views of Freedom’s own Old Home Week parades. Jane Nylander earned an A.B. in Political Science from Brown University, and an M.A. from the University of Delaware, Winterthur Program in Early American Culture. During her dynamic career, she has served in leadership positions with the Society for the Preservation of New England Antiquities, at Strawbery Banke Museum, at Old Sturbridge Village, with the New Hampshire Historical Society, and as Adjunct Faculty in the Department of American and New England Studies at Boston University. Please join Freedom Historical Society members for this exciting program on Monday, August 6, 7 PM, at Freedom Town Hall on Elm Street. The program is free and open to the public, and refreshments will be served following the lecture. For additional information, call 603-733-9307. 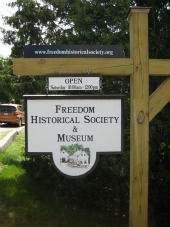 Join Freedom Historical Society’s 50th Year Celebration! The Freedom Historical Society invites you to the Freedom Art Gallery on Friday, June 29 from 6 to 8 PM to celebrate its 50th anniversary with cake, cheese, and beverages. We will give a toast to the next 50 years and reveal our 2019 Calendar, “Remarkable People of Freedom’s Past”. Join us as we celebrate 50 years of preserving the story of Freedom, and kick off our summer 2018 festivities! In the early 20th century, the New Hampshire Board of Agriculture launched a program to boost the rural economy and promote tourism through the sale of abandoned farms to summer residents. Cristina Ashjian, from the NH Humanities Council, will introduce the country house movement, and then discuss some of the great country estates featured in the New Hampshire program between 1902 and 1913. Which private estates were recognized as exemplary, and who were their owners? Using historic images and texts, Ashjian will discuss well-known estates now open to the public such as The Fells on Lake Sunapee, The Rocks in Bethlehem, and The Saint-Gaudens National Historic Site in Cornish. She will also include a local example. Cristina Ashjian is an art historian and an independent scholar based in Moultonborough, where she is presently the chair of the Moultonborough Heritage Commission. Her current research focuses on late 19th and early 20th century country estates. Ashjian holds an MA in the History of Art from the Courtauld Institute of Art, University of London; and a PhD in Modern Art and Architecture from Northwestern University. Please join members of the Freedom Historical Society for this interesting presentation on Wednesday, July 18 at Freedom Town Hall on Elm Street at 7 PM. The program is free and open to the public, and is part of the Freedom Historical Society’s 50th year celebration. Refreshments will be served following the presentation. For additional information, please call 603-539-5799. Please join us at the Camp Calumet Lakeside Facility for a program presented by Paul W. Pouliot, Grand Council Chief and principal speaker of the Pennacook-Abenaki People (Cowasuck Band). A graduate of the University of Massachusetts Dartmouth, he is also a religious elder of the tribe, lecturer, Tribal Historian and Tribal Historical Protection Officer. Paul’s grandparents were from mixed Wabanaki (Abenaki) and colonial French blood lines dating back to the early 1600’s. His family migrated back and forth between Quebec and New England through the generations. As a youth his father taught him of the ancestral roots of his grandmother and grandfather, both of whom were indigenous, and also taught him the ways of the woods and waters. Among his many accomplishments, Paul was a founding member of the New Hampshire Commission of Native American Affairs. This program addresses many questions which explain: what is an Abenaki; who is an Abenaki; when, where and some whys about the Abenaki that remain largely unknown today. Please join Freedom Historical Society on Wednesday, June 13 at 7 PM to hear Paul Pouliot’s fascinating presentation. The location is the Camp Calumet Lakeside Facility located at 1090 Ossipee Lake Rd, West Ossipee, NH 03890. The presentation is free and open to the public. For additional information, please call 603-539-5799. What is the value of a view? What is its cost? Freedom Historical Society welcomes Bob Cottrell for his insightful presentation, “Chocorua for Two Bits: The Value of a View: Art, History and Nature.”, which will address these questions. Why two bits? As of 2013 you can hold in your hand an artistic rendering of the famous view of Chocorua on a new quarter for 25 cents, (historically known as two bits). You can also purchase a painting of the same view for tens of thousands of dollars. The Chocorua quarter is part of the America the Beautiful Quarters® Program of the United States Mint and features the White Mountain National Forest. Ironically, this famous view is not part of the White Mountain National Forest; neither is it preserved by the Federal Government nor any public entity. The story starts, as most do, with whiskey and opera, then explores the legendary tales of revenge and murder that led to the preservation of the view. It continues with civil war generals, preachers who lived on Heavenly Hill, sawmills shut down so Boston Brahmins could swim without sawdust polluting their bathing, a horse that hiked daily from Silver Lake to the summit of Chocorua, robber barons, novelists, Pulitzer Prize winners, famous Japanese landscape gardeners, geologists, botanists, birders and wildlife biologists, mycology, Abenaki rug makers, iron workers, candlelit canoe parades, tennis tournaments, polar explorers, ice harvesters and CCC camps. Bob Cottrell has a master’s degree from the Winterthur Program in Early American Culture in Delaware. He is the Curator of both the Nella Braddy Henney History Room at the Conway Public Library and the Conway Historical Society. He also serves as an independent history and museum consultant, (Curator for hire), and is a speaker with the New Hampshire Humanities Council. Please join members of the Freedom Historical Society on May 16 at Freedom Town Hall on Elm Street at 7 PM. The program is free and open to the public. Refreshments will be served following the presentation. For additional information, please call 603-539-5799. The Freedom Historical Society is celebrating its 50th year of incorporation. On May 22, 1968 the papers were signed. The Society had its beginnings on March 30, 1965 with first meeting, organized by Barbara Dutton and Molly Cunningham. They and other key citizens (see below), spent three years getting the Society established and organized, producing by-laws and setting a path that they hoped would be sustainable. This is what we are celebrating in 2018, and it is so pleasing to be able say that the Society is still going strong after all these years. “Preserving Freedom’s history for future generations”. Other organizing members present at the first (1965) meeting included Melvin Watson, Wesley Milliken, Lettie Thurston, George Littlefield, Emma Perkins, Kenneth Alexander, David Dutton and F. Graham Cunningham. On September 6, 1967 the following met as the “First meeting of Incorporators”: Barbara Dutton, Molly Cunningham, Mabel Davis, Luke Hatfield, Merue Page, Clem Lovell, Mrs. Francis Bryant and Jack Middleton. It was Jack Middleton who volunteered, and accepted the role of attorney to file all application papers for the incorporation, which were finally accepted and signed on May 22, 1968. The Freedom Historical Society has announced their schedule of programs for 2018. Click here for the full list, and check back often for upcoming program details.